Wishing a Happy Father's Day to all the father's in blog world. 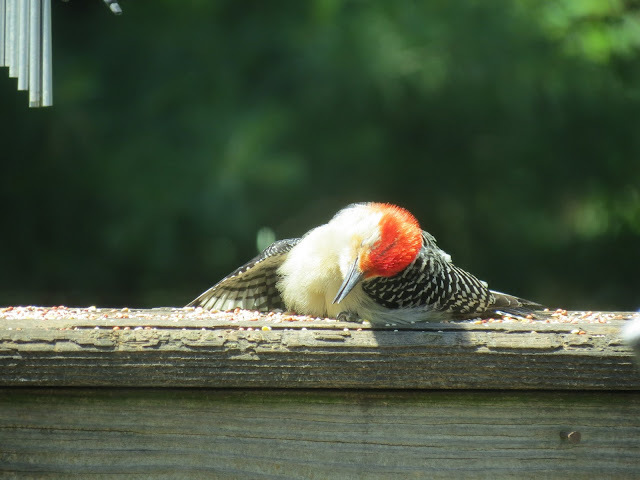 I am sharing my male Red-bellied Woodpecker. He is a treat to see any time he visits my yard. The Red-bellied Woodpecker put on a show for me. The woodpeckers are always vocal around my yard. If this one sees me outside he will start chatting away. I think he is asking for some peanuts. How cute the little woodpecker is! Happy Fathers day! Here we celebrate it in November. He's very handsome! I love woodpeckers. Have a happy weekend, Eileen! You are so lucky th have them in your yard. This one is a gem, so entertaining. What a wonderful bird coming to your bird tabe Eileen especially one that talks to you! MAny thanks for hosting and I hope you have a happy weekend. Beautiful series of photographs of the Red-bellied Woodpecker. he sure looks like a character actor. great shots. I WISH　I can visitmany of my kind friends this weekend. Hi Eileen--love your silly red bellied woodpecker. He's quite a showman! What a cutie. And the one with him sprawled out is so unique. Happy Day. Hi Eileen. Beautiful Red-bellied Woodpecker. I wish one will come visit my garden too. Have a beautiful weekend! That's quite a display! e gave a stunning performance for Father's Day LOL! Super photos Eileen and thanks so much for hosting! 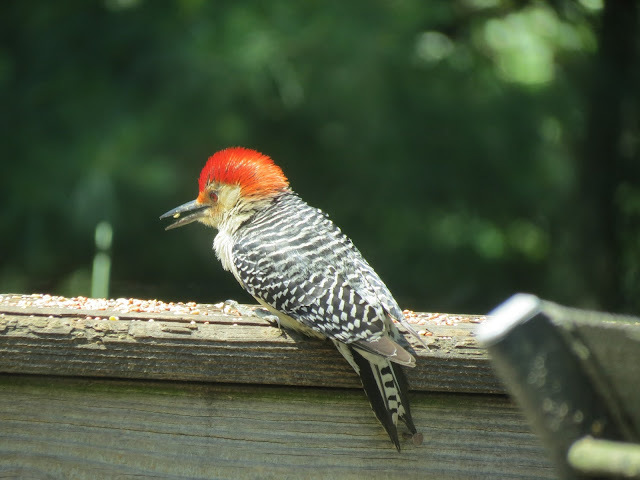 Lovely shots of your Red-bellied Woodie. Bem apanhado este belo pássaro, excelentes fotografias. I love these lovely photos !! Your bird photos are always outstanding; love that redhead! Have a great week-end!! Your little red bellied woodpecker put on a cute show for you to photograph. Happy Father's Day and Happy weekend! What a coincidence my post for today is abut the colour red! Mr Red Bellied Woodpecker put on a great show for you. Flirting I think . . . Happy Father's Day weekend Eileen . . .
what an adorable little stage man, some of those poses are just too cute!!! happy fathers day to the husband and have a wonderful weekend!!! and many thanks for hosting!!!! That's a lovely bird to have coming to your table Eileen. Is it anting as well as eating? Nice pictures. Have a happy family day tomorrow. So very beautiful this series of red belly woodpeckers, this one simply looks so cute. What a cutie with that fluffy red head. Great pics! What a silly bird. He must be so fun to watch. And happy Father's Day to all the fathers in your world. Yep, even to the woodpecker. What a cutie pie---I think it is a wee one, He sure put a show on for you. Awww - great captures, Eileen! Those woodpeckers are so fun to watch! My pair were at the suet block feeding their baby earlier this week - such a treat - thanks for hosting! Beautiful bird. I love the scarlet. We have just three woodpeckers in UK, Greater Spotted, Green and Lesser Spotted. The latter is shy and difficult to spot. Eileen, great shots of the "redhead". Hi Eileen, Oh what cute photos. He's handsome! Blessings to you and yours this Father's Day weekend. What a delightful post, Eileen! I can see why you enjoy his visits, he is a beautiful bird, and it looks as if he was posing for your photo shoot! :) Best wishes to you this Father's Day weekend, as always. The Red-bellied Woodpecker is awesome, pretty things. 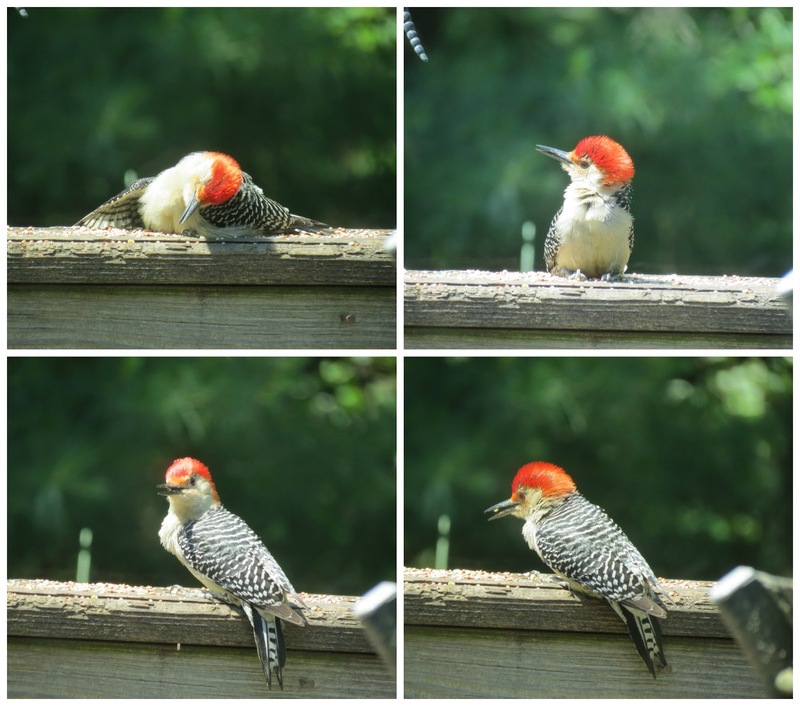 What adorable shots of the woodpeckers! Have a fantastic weekend! He put on quite a display for you! What a display he put on for you, or was he just playing for his food?Lovely set of photos. Hi Eileen, Excellent photos of the Red-bellied Woodpecker. Enjoyed this Saturday's Critters post. Have a happy weekend! Looks like you got a real model here. Thank you for sharing. Beautiful photos! Thanks for hosting, Eileen, it's wonderful to see everyone's photos. I'm always delighted by visiting your so lovely blog, my Beautiful Lady, I'm so grateful to you for another wonderful post of yours, your wildlife amazes me more and more ... and let me say that this woodpecker is truly charming and far too nice ! Hamming it up for the camera..that's for sure..Hope you are having a good weekend..
Oh Eileen....these images of the 'pecker are so amazing!!! The lighting...his antics. Perfection all the way around. And, thanks again, so much, for adding your post link at I'd Rather B Birdin'. I love the photos of the woodpecker, such bright colors. He is a interesting looking bird, we don't have woodpeckers here. I have an industrious Woodpecker outside my window but he is lacking the red panache. Look at him taking a bow! he is just adorable!! :) A show indeed! Now that's a hip, punky bird! Great photos, Eileen! Have a good week and thanks for hosting. Those are terrific shots, Eileen. 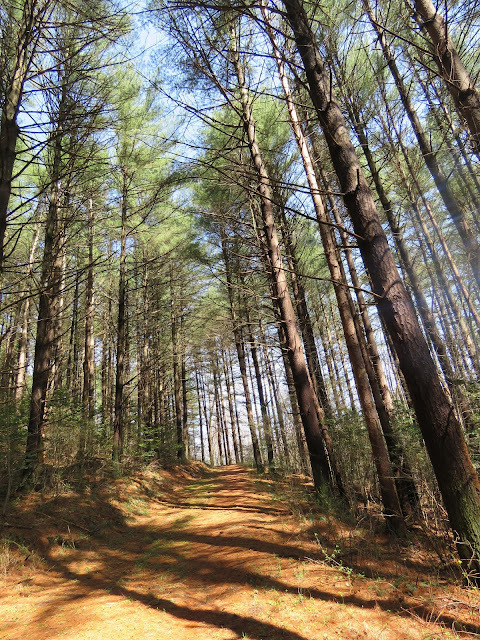 When the West Virginia Red-bellieds see me, they let out a squawk and fly off into the woods. So cute and beautiful little red woodpecker! never seen before such amazing bird! Fascinating critter, indeed! Greetings and have a great week ahead! What a delightful show that cute little woodpecker put on for you. He looked as though he gave you a beautiful bow too! Your woody has a lot of personality! In that one photo it looks like he's taking a nap! your photos of the woodpecker are fabulous ! What a lovely visitor to your yard! I wish you a good week! Wonderful patterns on its wings! Great shots of the Red-Bellied Woodpecker! 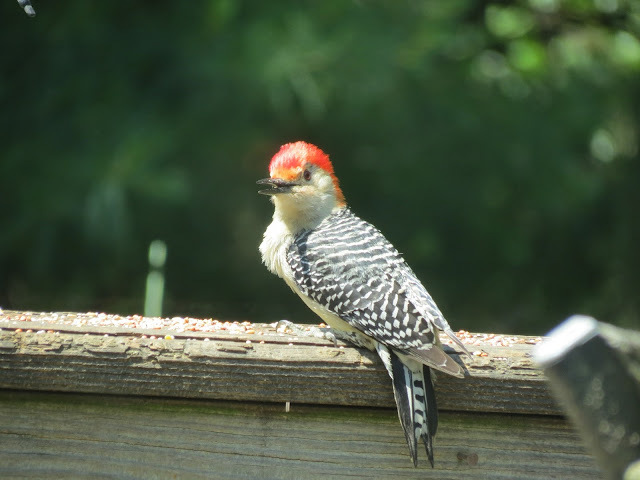 Tho I am behind in reading blogs, I have to say that just about two hours ago, I saw a Red-bellied on my seed feeder! First time in quite a while... It seemed smallish... I think it was a juvenile too! Will try to blog about my birding today... Thanks for sharing!